Debrecen is mentioned in the article in Pester Lloyd after the scandal about the letter to Etelka Kákonyi has broken. It refers to the unpatriotic behaviour of Czech soldiers who were stationed there. Debrecen is the second largest city of Hungary, situated in the eastern part of the country near the border with Romania. Debrecen (at the time written Debreczen) was an important garrison town both for K.u.k. Heer and Honvéd. In this case the quote from Pester Lloyd surely refers to the replacement battalion of IR28 that was relocated to Debrecen early in 1915. Debrecen is also mentioned in the story Turista Aratáš that Hašek had published in Venkov in 1911. The main protagonist, the quarrelsome tourist Sandor Aratas who is an a trip to Venice, is a land-owner from the city. Pressburg is mentioned because the newspapers in the city also write about Lukáš and the letter scandal. Pressburg (hun. Pozsony) was in 1915 the capital of Upper Hungary, and has since 1919 been known as Bratislava. At the time more than 80 per cent of the population were Hungarians or Germans. Pressburg was the capital of Hungary from 1541 until 1784, and the Hungarian parliament held its sittings here until 1848. The city is located by the Danube just a few miles from Bruck an der Leitha and is the capital of modern Slovakia. [2.4] „Stejně líbezně, pane nadporučíku,“ ozval se plukovník Schröder, „píše o vás též týdeník v Királyhidě a potom prešburské listy. To vás ale už nebude zajímat, poněvadž je to na jedno kopyto. Politicky dá se to odůvodnit, poněvadž my Rakušané, ať jsme Němci, nebo Češi, jsme proti Maďarům přece jen ještě hodně... Rozumíte mně, pane nadporučíku. Eger is mentioned by Colonel Schröder when he boasts to Lukáš about his adventures with Hungarian ladies when he was on a three week telemetry course in Eger in his younger years. Eger then reappears in [III.2] when there is talk of damaged material from the offensive "beyond Lwów". From this passage it even seems that the route of the march battalion was planned through Eger, even though it is NOT on the railway route from Budapest to Sanok. Apart from the geographical inconsistency there is a time jump involved. Although the stay in Budapest explicitly takes place around the time of Italy's entry in the war May 23 1915, the offensive east of Lwów could only have been after 23 June when the city was recaptured by the Central Powers. 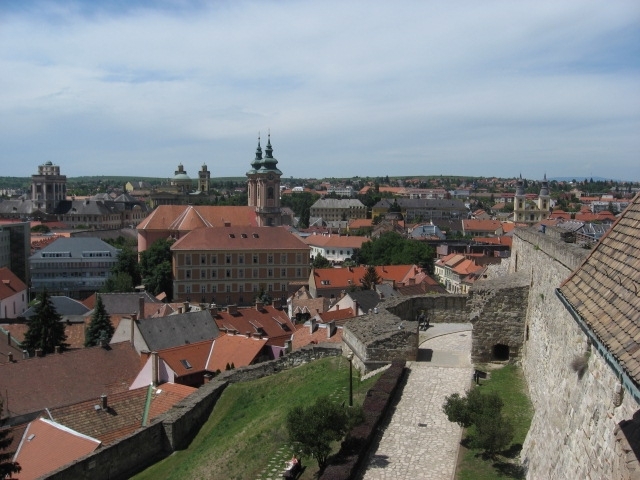 Eger is a town in northern Hungary, best known for its red wine. [2.4] „Neříkejte, pane nadporučíku, že jste teprve začal korespondovat. Já, když jsem byl ve vašich letech, seděl jsem v Jágru na měřických kursech tři neděle, a měl jste vidět, jak jsem ty celé tři neděle nic jiného nedělal než spal s Maďarkami. Každý den s jinou. Mladé, svobodné, starší, vdané, jak to právě přišlo, žehlil jsem tak důkladně, že když jsem se vrátil k regimentu, sotva jsem pletl nohama. [III.1] Také se rozšiřovalo po nádraží, že u Jágru srazil se jeden sanitní vlak s nemocnými a raněnými s vlakem vezoucím dělostřelectvo. Ve Slupech is mentioned by the infantry-man who had beaten his aunt to death and had been investigated in the mental hospital here because of this. Ve Slupech probably refers to the street Na Slupi in Královské Vinohrady where there used to be a colony for the mentally ill. It was a branch of Kateřinky. The property belonged to Kostel Zvěstování Panny Marie, now a Russian-Orthodox church. Bohnice is a suburb of Prague where in 1903 one of the most modern mental hospitals in Austria-Hungary was founded. Jericho is mentioned by Švejk through the expression Rose of Jericho. Jericho is a historic town in the Palestine, commonly regarded the oldest city in the world. It is also on the lowest altitude of any town, 250 metres below sea level. Rose of Jericho is a name for a resurrection plant. Moravská Ostrava is mentioned in an anecdote by Švejk, where he illustrates the importance of never admitting to anything in court. It is also revealed that this is one of the places where Švejk has worked. Moravská Ostrava is the former name of Ostrava, an important industrial and mining town in northern Moravia. Modern Ostrava was created in 1924 by the merging of 7 municipaliries, the largest of which was Moravská Ostrava itself. Hamburg is mentioned in an anecdote by Švejk, where he explains the advantages of feigning retardedness. This story is about the intelligent professor of economy who claimed a tragic background and who subsequently got away with desertion. Hamburg is the second-largest city in Germany and the seventh-largest city in the European Union. The city is home to approximately 1.8 million people and has one of the largest ports in Europe. It is an important centre for trade and commerce. [2.4] Že jednou se probudil v Hamburku a podruhý zas v Londýně, a že nevěděl, jak se tam dostal. Otec že byl alkoholik a zemřel sebevraždou před jeho narozením, matka že byla prostitutkou a opíjela se a zemřela na delirium. Berlin Westbahnhof is mentioned in the description of Ruller who is looking at drawings from the Berlin West railway station toilets, reproduced in a book by Krauss. Berlin Westbahnhof was according to the author a railway station in the western part of Berlin although a station carrying this name has never existed. Grete Reiner's translation provides a clue though. Here it appears as Berlin Nordbahnhof so she presumably corrected the author. [2.4] Zadíval se na reprodukci naivních kreseb mužského i ženského pohlavního ústroje s přiléhajícími verši, které objevil učenec Fr. S. Krause na záchodcích berlínského Západního nádraží, takže neobrátil pozornost na ty, kteří vstoupili. Velké Popovice is mentioned by Švejk during the famous farewell scene in Királyhida. Sapper Vodička asks what beer they have at U kalicha, and Švejk answers: "Velkopopovický". Velké Popovice is a town on the southern perimeters of Prague, known for its brewery. Velkopopovický beer is reported to have been a favourite of Jaroslav Hašek. It is still popular, now better known under the Kozel brand. The black variety is still served at U kalicha as in the times of Švejk, but in contemporary Praha U černého vola (At the Black Ox) is a popular hospoda which pulls pale Kozel in large quantities. Here are some numbers which shows that hop trader Wendler had all reason to be worried. The prodcution volumes at Velké Popovice from 1913 until 1919 were (in 1000 hectolitres): 230, 199, 181, 130, 37, 25, 38. These figures put the term "economic crisis" into perspective. Production didn't reach pre-war volumes until 1924. [2.4] Potom se vzdálili a bylo slyšet zas za hodnou chvíli za rohem z druhé řady baráků hlas Vodičky: „Švejku, Švejku, jaký mají pivo ,U kalicha’?“ A jako ozvěna ozvala se Švejkova odpověď: „Velkopopovický.“ „Já myslel, že smíchovský,“ volal z dálky sapér Vodička. „Mají tam taky holky,“ křičel Švejk. „Tedy po válce v šest hodin večer,“ křičel zezdola Vodička.